The concentration of carbon dioxide in the atmosphere surpassed 400 parts per million (ppm) this March -- a barrier that, when it was first crossed in May 2013, marked a terrifying milestone. 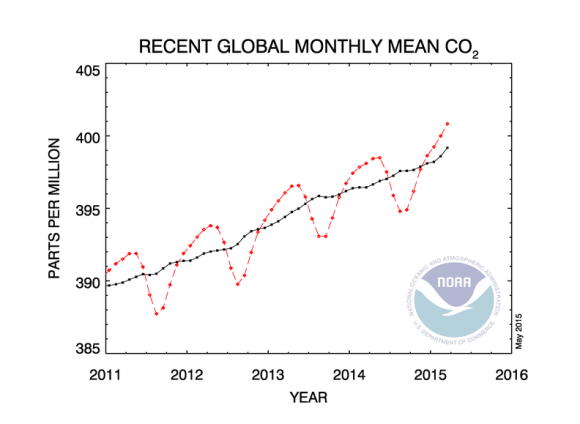 Those records just keep coming: in 2014, CO2 concentrations surpassed that barrier a full two months earlier than they had the year before -- which is significant because the long-term rise in CO2 is subject to seasonal variability, and doesn't typically peak until May. This year, according to data released Wednesday by NOAA, not only did CO2 peak early (an occurrence that was no longer even newsworthy) -- the average for the entire month of March was above 400pm, for the first time in recorded history. CO2 emissions, of course, along with other greenhouse gases, are a key contributor to climate change, and they've been on the rise ever since humanity began burning massive amounts of fossil fuels. 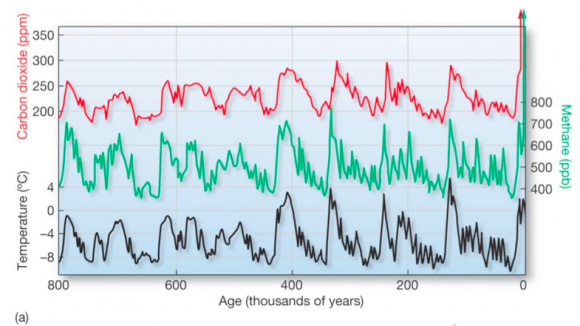 For most of human history, atmospheric CO2 levels were around 275 ppm. The last time they were this high predated modern humans, and things did not go well for the planet: the seas were 100 feet higher than their current levels, and the average temperature was 11 degrees Fahrenheit warmer.